Microphone Noise Reduction enhances speech communications by reducing background noise and increasing the SNR of speech. In almost any application related to sound capture and audio communication, the microphone not only picks up the signal of interest, but also picks up other audio sources, such as wind noise, that lower the quality of the signal of interest for the far-end user. Our microphone noise reduction software is used in commercial and military applications such as call centers, aircraft and other harsh acoustic environments that impact voice communications. Depending on the information that is available, VOCAL’s microphone noise reduction software and digital signal processing algorithms use several different methods to effectively reduce noise. The classical approach for the application of a single-channel active microphone noise reduction solution is spectral subtraction. There are many sources of noise comprising different spectrum characteristics, either time-invariant or time-varying. In spectral subtraction, the idea is that the acoustic noise is additive and thus can be subtracted from the disturbed signal. This concept is relatively simple but relies solely upon an accurate estimate of the noise spectrum. Therefore, the main criterion for a single-channel noise reduction method is obtaining an accurate time-variant model of the system. In more modern systems, components related to speech are also estimated and enhanced to provide a higher overall SNR. For example, some speech enhancement software routines estimate the pitch frequency of a voiced section of speech and then apply a comb filter to remove spectral components not associated with the pitch frequency and its harmonics. Spectral subtraction processing is performed in VOCAL’s Noise Reduction software in the frequency domain. The digital signal processing algorithms is designed and tuned for optimal performance at sampling rates of 8kHz and 16kHz. The noise reduction software estimates noise spectrum, from which the a-posteriori SNR ratio, the a-priori SNR and the probability of speech presence are used to determine the frequency-dependent gain for attenuating the noise components. Single channel noise reduction in acoustic environments where the sound source and microphone are located some distance apart, reverberation will most likely be a problem. Because we do not have access to the original sound source, dereverberation via deconvolution filters a model of the room impulse response from the received signal. One approach to this acoustic noise reduction problem is to use a linear prediction analysis algorithm. Based on the knowledge of the human speech production system, only the LP residuals will be affected by reverberation. This information can than be applied to an update of the adaptive filter for deconvolving the room impulse response from the received signal. 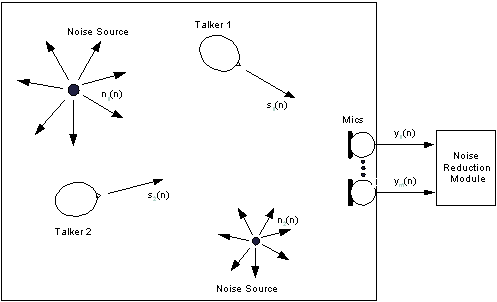 In multichannel scenarios for active acoustic noise cancellation, usually a second microphone is placed near the noise source and far enough away from the sound source so the signal from the second microphone can be used as the estimate in the spectral subtraction technique described above. In a multichannel noise reduction system where the direction of arrival information is unreliable, a Dual-Channel estimation technique can be used with acoustic noise cancellation algorithms. This is an extension of the single channel estimation method and uses the phase difference information to determine the probability of the presence of speech and to estimate the speech spectrum components. In acoustic beamforming the spatial relationship of a microphone array is used for active microphone noise suppression and control. If the direction of the sound source relative to the microphone array is known then an acoustic beamformer can be designed to pass signals coming from the sound source and filter out signals coming from different directions. This approach to microphone array noise reduction is most applicable to a situation in which multiple people are talking but only one is desired to be heard. VOCAL’s microphone array software supports planar, cylindrical, and spherical microphone array orientations. The maximum number of microphones that can be processed for real-time applications is limited by the capabilities of the processor.